HDT’s electrosense pod, suspended on a gantry during water tank testing. The small dark dots along the outside of the sensor pod are detectors for measuring the electric field. Many fish, such as sharks, have passive electroreceptive sensory organs in their lateral lines, which helps them sense other fish in the water. There are about 200 species of fish, however, that actively emit a very weak electrical field, in order to greatly enhance the sensitivity of their electroreceptors. These fish can use their electrosense to hunt for flea larva – at night in completely turbid water. 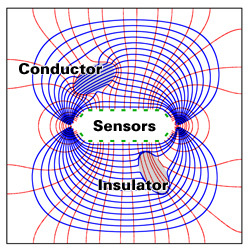 In active electrosense, a weak electric field is emitted along the long axis of the sensor pod, which is lined with detectors. These detectors sense slight perturbations in the electrical field, caused by objects in the water. Combining the signals from the detectors allows us to accurately locate these objects and detect their composition. Because we are sensing the interaction of a detected object with our electrical field, we can determine the object’s composition. Plastic, metal, and wood all have distinct electrical properties underwater. The weak electrical field used for electrosense detection attenuates rapidly. The maximum range for detecting objects is about three body lengths from the sensor pod. The electrosense field drops below the background noise level in the ocean within about ten body lengths of the sensor pod. If frequency hopping is employed, it is nearly impossible to detect the electrosense field, without knowing its precise hopping pattern. The low-power electronics used in HDT’s electrosense system are very compact and inexpensive. Sophistication of the system lies in the software used to process the signals. Electro-locating and classifying objects is similar to how an MRI or CAT scan is processed.